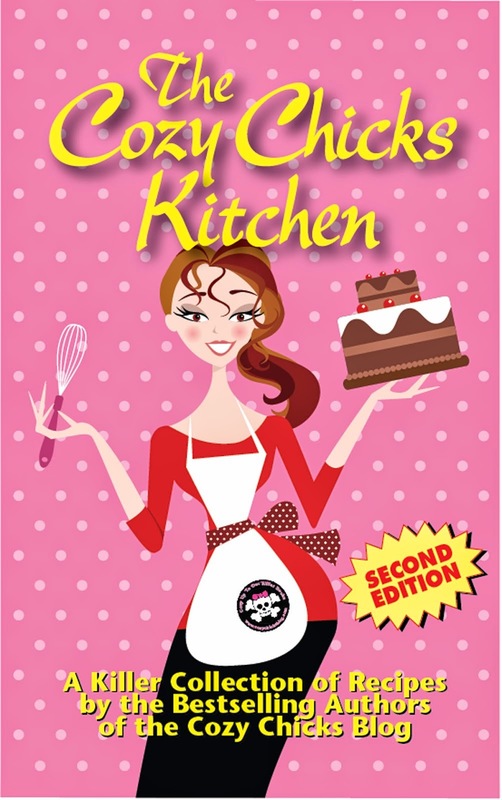 Cozy Chicks: Ghosts…do you believe? Duffy Brown here and I just got back from vacation. I toured houses, villas and churches and heard endless tales of days gone by and how some occupants refused to leave. Yep, that’s right ghosts are everywhere in Italy…drinking fine wine and eating lots of good pasta no doubt. This interested me as I just happen to live in a haunted house here in the US. I know I know, many of you don’t believe but I swear we have slamming cabinets, doors closing, books sliding, things moved and voices when no one’s there. It’s been so bad a few times I went to the top of the stairs and yelled, “Who’s there?” My daughter’s room is really creepy with lights and cool spots. I’m letting a writer friend sleep there on Saturday. Since she writes vampires this shouldn’t bother her one bit. And my cats stare at nothing in this one corner of the house. Their fur stands straight up, they hiss and they get the bushy tail thing. What is that all about? I thought it was just my cats going nuts but then my son’s dog does the same thing. My daughter went to art school in Savannah, the most haunted city in the USA, and stayed in a really old apartment building. One day she could not find her drafting pencil, looked everywhere and finally found it in the bottom of an old art box she hadn’t opened for months. From then on her pencil always went missing and she always found it in that very place. She hand an artsy-fartsy ghost. Ask anyone who lives in Savannah and they have a ghost story to share. When we stay at this B&B the ghosts love to play with our cell phone and alarm clock. 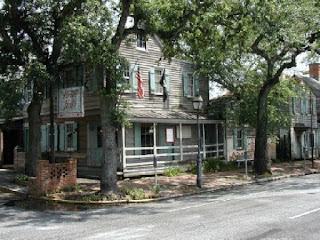 I had the owners of the Pirate House take me on a tour of his restaurant…the oldest building in Savannah. RL Stevenson wrote Treasure Island there. 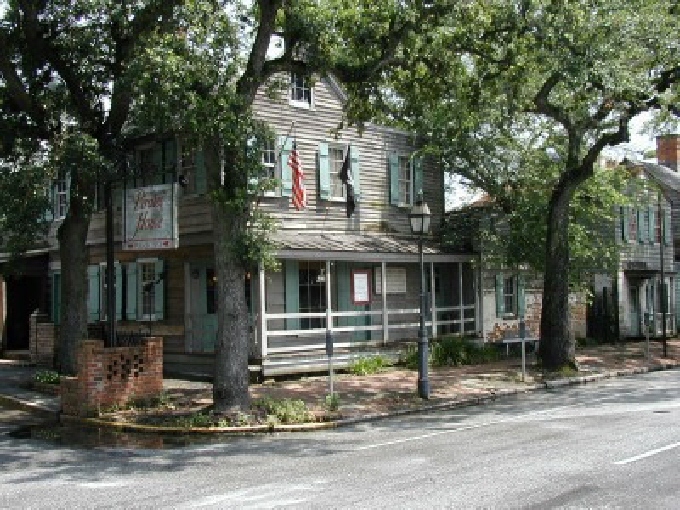 The inn where the map was found was taken off the Pirate House. The help had some great ghost stories to tell. One involved blueberry pie flying across the room. Mackinac Island is haunted like crazy too…or so the tour guide say. The courthouse is still frequented by long ago fur traders brought to trial for stealing pelt, getting drunk as a skunk and causing havoc in the local watering holes. Has anyone ever messed with a ouija board or been to a séance? Maybe a psychic? When I was first married we went to this restaurant and the waitress dabbled in palm reading. Said I’d have 4 kids and be a write…the only thing I was writing at the time was checks. Very strange how she knew. Soooo, does anyone have ghosts in their house? Stories to share? I lived in a haunted house for about four years. While I never came face to face with the ghost I named Franklin, I was witness to many of the things he did, and he even seemed to target some of his "pranks" around me. It's said that a child going to puberty can stir up a spirit. I guess because of our emotions and all our bodies are going through. We stayed at The Marshall House in Savannah when our oldest daughter got married in Savannah. The help had some really interesting stories. There is a little girl that haunts the hotel. We were staying on the end of a hall, my sister in law was in the next room. There was some children in the wedding party. I heard this awful commotion in the hall, giggling and a ball bouncing. My Sil and I both came out of our rooms instantly to yell at the kids and there was nothing there. We looked at each other and quietly went back into our rooms. 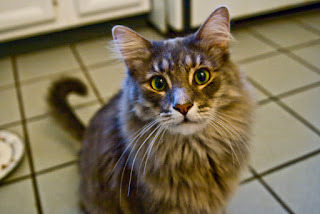 I've read a number of book written by mediums since my husband passed and have learned that dogs and cats we've had in the past often come to visit us, and pets who are living can see them. I would assume our loved ones in spirit also drop by and that might frighten a pet, who wouldn't know they were different from a living human, just a stranger in the house. I worked for several years renovating old factory buildings. Probably more than not had unexplained happenings. Most apparent is Orville Gibson, developer of Gibson Mandolin which grew to become Gibson Guitar. Orville never seems to cause trouble but makes his presence felt around the original Gibson factory in Kalamazoo, MI. Yes! That’s totally it here too. And it does freak me out and when the dogs start doing the she thing it gives me the creeps to no end. What in the world is going on around here. I'm not necessarily a believer, but then not a disbeliever either. Duncan had a "girlfriend" on a Dogster group we belonged to, she loved to swim in her family's pool. After she went to the Rainbow Bridge, Duncan would sometimes, when we went out the late evening stroll, stop and look at the neighbors pool and sniff the air. A couple times he jumped and would look around. Then one evening I took the camera and took a picture, after I downloaded the pictures, I could see an "orb" in one of them. On the paranormal side. Shortly after getting married, we went to a relatives lake cottage. They asked if she wanted to waterski and before she got in, I asked if she wanted to take off her rings, no she replied. Well, when the slack was taken up on the tow rope, the bar caught her wedding band and ripped it off. She got just a nasty cut and of course the ring became fish food. Upon arriving home, we lived next door to my parents, I father came rushing out and asked if one of us was hurt. He said that about 3:30 he had the feeling that one of us was injured. This was about time that the incident happened. Supposedly, three or four generations back, one of our relatives had "the power" and also reportedly held séances. In the house where we lived for 26 years, I would often hear noises -- doors opening & closing... and footsteps in the short hallway -- when I was napping and the house was otherwise empty. One time my daughter and I were talking about the ghost(s), when -- right above her head, mounted on the wall behind the couch she was seated on -- the door to the wall clock opened and the clock innards made a noise. 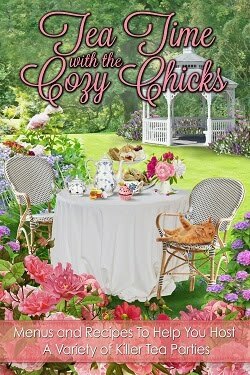 Have you read Dixie Lyle's Whisky, Tango, Foxtrot series? The trio are protectors of an animal cemetary where animals can leave their afterworlds to visit dead people or other animals they knew in life. Ohhhhh, yes, Duffy. Spirits are visiting. Cats and dogs have the more developed sixth sense and I definitely believe they are seeing them. I have a certain level of psychic gift which has increased over the years. Information simply "comes thru." And I definitely believe spirits show up. Especially if they have died in that house. My first Ft Collins house still had the spirit of the gentle wife of the former owner. She died of cancer in the home. While I was writing during the day I would hear the floor above creak and creak in different places. Dogs outside, I'm alone. Dogs would stare sometimes inside the house. Savannah----ohhhhh, yes. Read that wonderful novel, "Midnight in the Garden of Good and Evil." But Ruthin Castle In England was my favorite. The Gray Lady inhabits since Medieval days. She murdered her husband's lover and was executed there. It's now a wonderful "specialty" hotel for banquets and stays. You hear her footsteps walking up to your room door, but when you open it, no one to be seen. One of my chorale friends (our chorale was on a European singing tour) was trying to pack while her husband was lying on the bed reading. The room lights kept going on then off, and on then off, several times. My friend looked at her husband lying in bed and his eyes were as wide as saucers. So, my friend looked around and spoke clearly: "Well, hello, Gray Lady. I'm so glad you visited us. Thank you. But it's time for you to leave now." The lights flipped back on and stayed. :) From what I've learned, visiting spirits simply want you to acknowledge them. I would advise to be polite. Holy cow, Jeff!!! If that door opening isn’t a sign I don’t know what is! Yikes! Oh, Maggie, these are amazing stories!!! 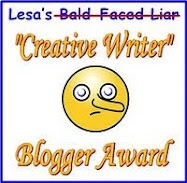 You need to blog on them, I just love hearing others “happenings” esp when they are tuned in. I need to pay more attention in my house in what’s going on around me…or not. I’d probably freak out and sell the place. LOL. Thanks for chatting. Hugs, Duffy. I think Dutch people are too "sober" or "staid" to believe in ghosts, as I have never heard ghost stories around here. Although there was that tv series The Ghost Whisperer a few years ago, when a Scottish medium visited people here in Holland who had problems. Still, no famous building here as far as I know. I would so visit there, although those fake haunted houses at the carnival freak me out. totally freaked us out. It never did either thing --- before or after that time when we were talking about the ghost. And after we'd been gone a couple of years, I was in contact with a neighbor who told us there had been a diff. set of occupants about every six months since our departure. (it had been bought by somebody who rented it out). Then that former neighbor asked, "is your former house haunted?" We had never said anything to the neighbors about our ghost! Oh, no, Duffy. It's enough with all these characters dancing around inside my head. I definitely do NOT need or want to communicate with spirits. :) They can find someone who's not writing novels to spook. Hi, Aurian. I think there is something to the fact that you have to be open to the possibility. Though there are times when whey you think…holy crap what was that? LOL If you get to the US we’ll go ghost hunting together. Thanks for chatting. Holy cow, Margo!! Your winery is totally amazing!!!! Love the caption…What is the difference between a wine and a spirit? At the Winery at Marjim Manor, wine is what you taste; spirits are who you meet.